Enhancing is a way to level up your gears to make better and usable for a longer period of time. 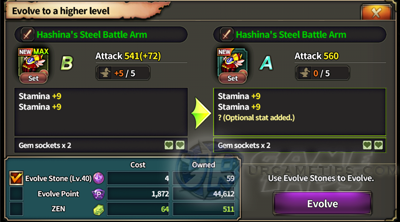 Once your gear reaches max level for enhance, you can evolve the gear and increase its Grade to the next tier, making it a whole new gear to use. - From Lvl 5 Weapon, all items will start to rotate every 5 levels. 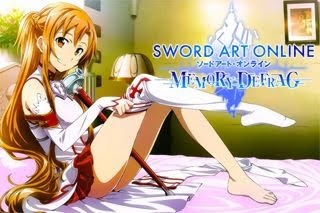 - Can be farmed from Dungeon Stages and Monster Wave. - Items with (S) on their icons are Set Items that can only be farmed from Boss Raids. - These items rotates every 10 levels, so it's good to invest on them. Can be obtained from Arena victory rewards, V Pts weekly rewards, Missions and Login events (Accessory Coupons). - Higher Grade and Item Lvl yields higher stat bonuses. - Note: An item with "+" will also get an additional bonus, it's either a [Raid Exclusive Stat] or a [+1 Gem Slot!]. Primary stats and stat bonuses are somewhat same though with the regular ones. - For late game gears, aim for set or non-set items with "+1 Gem Slot" bonus, with all the types of Gem Slots you like (bonus stats doesn't matter), then proceed below to enhance, evolve and reset the item! Enhancing will only increase the primary stats of the item, not the bonuses, so if you really don't intend to, then only enhance your items if you want to evolve them. - Enhancing is one of the biggest money sinkers in the game, only do serious enhancing at Lvl 30+, where you have lots of gold and the fees are affordable, stop if you feel that the fee is way too much. - Always maintain at least 200k to 500k Gold. - Items with higher grade and Lvl will give better results. 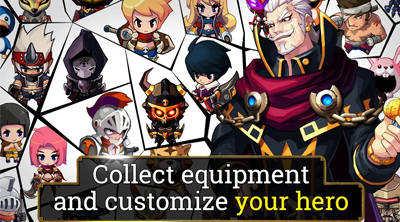 - Each item included regardless of the item's Grade and Lvl will increase the fee by a fixed rate, so it's better to aim for the minimum number of items possible to reach 5/5 enhancement. - Try to reach the 5/5 enhancement with less than 20 items. - D > C = use Grade D weapons, preferably high Lvl ones. - Grade C non-weapon items can also be salvaged if your inventory is getting full, start from your low level item gears. Note that weapons gives better results than other type of gears. - Grade D accessories are ok to keep since accessories are somewhat harder to get. - Use and configure the "Auto Select" feature to quickly scan and salvage all Grade D items in your inventory. Upgrading the item to the next Grade will add additional bonus Stat or Gem Slot depending on the next Grade, refer to the Item Grade and Bonuses section above. If you are lucky, there is also a rare chance that a regular item will get a "+" bonus after evolving. - As much as possible, save your Evolve Points for the "Reset" feature and only use Evolve Stones for Evolving Items. - Ex: Evolve Stone (Lv.20) = can only be used for Lvl 20 or lower item. How to Get More Evolve Stones? - Reward from Daily Mission. When to Evolve to S or SS? - Try to advance the game with only Grade A gears (changing every 5 or more levels), and only upgrade to S or SS once you get stuck and need some boost (must be at least Lvl 30~35!). - or if you reached Lvl 40+ or 50+ where leveling up is getting slower, and monsters are getting stronger. - S or SS gears can be used for 10 to 15 more levels (from the item's Lvl) before changing, so only do this at higher levels. - Example Tip: A Lvl 30 Grade S weapon can be used until Lvl 40, because a Lvl 40 Grade A weapon has better primary stats than a Lvl 30 Grade S weapon. This is a suitable time to start farming and change sets or some items if you like. - Evolving to a higher Grade will also require you to Reset the Stats of your newly evolved item to get higher bonuses. If left alone, your item will just have an upgrade to it's Primary stat like DEF, ATK, and more.